Which is a good thing because they would block traffic across this essential connection. The Hell Gate Bridge and the NY connecting RR are the connecting link for what would become the Northeast corridor and they make though passenger and freight traffic from the South to New England possible. This was a very expensive undertaking as the track bed had to be raised high enough to clear shipping traffic. At the time of it’s construction the Hell Gate bridge was the largest arch bridge in the world and I think that it is still in the top twenty. Not bad for a 100 year old bridge. 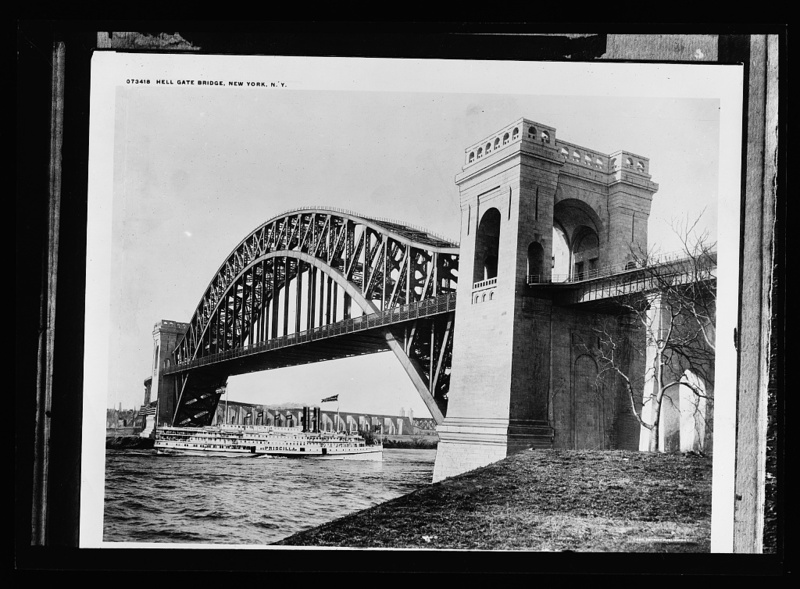 The Hell Gate Bridge was the keystone of the NY Connecting Railroad, whose sole function was to provide a link between the Pennsylvania Railroad’s NYC extension and the New Haven Railroad’s Bronx terminals. The bridge and the NY Connecting Railroad were the final part of the massive NYC tunnel extensions project that the Pennsylvania Railroad started in 1904. 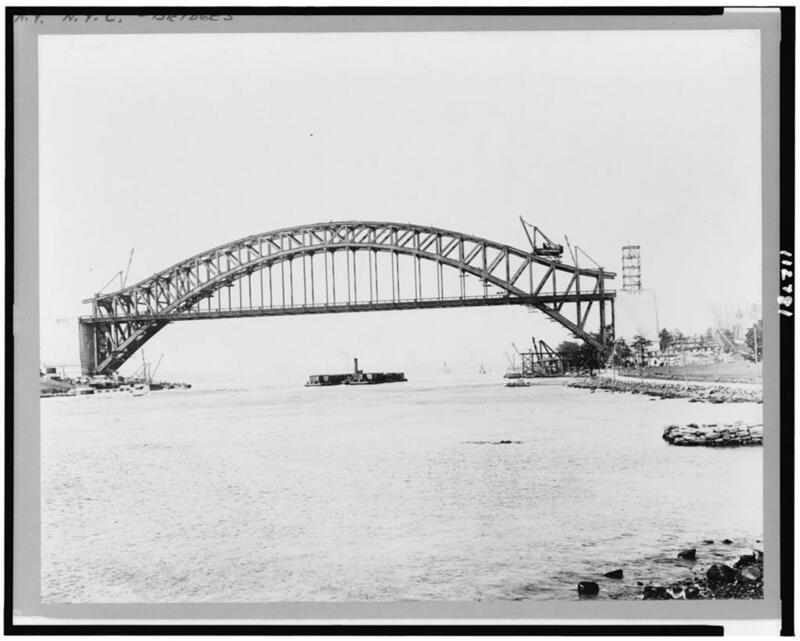 The Hell Gate Bridge was started in 1914 and completed in early 1917. The bridge cost 14 million dollars and the approaches probably added another ten million to that. This was a huge investment for the Pennsylvania RR which issued a large part of the checks and it was an investment that didn’t really benefit PRR except for providing operating efficiencies with the PRR’s connections, specifically with the New Haven. While the benefits to operation were obvious, I’m not sure that they outweighed the large costs in infrastructure. According to a characteristics chart for 1919, shortly after the Bar Ridge terminal opened the New Haven ran 13 trains South and 12 trains North with the heaviest traffic northbound due to the New Haven’s long term problem with having too many empty cars outbound. The 25 trains to Bay Ridge compares to 43 for Maybrook, the New Haven’s other western connection. Of course for Bay Ridge you also have to add any LIRR traffic to Fresh Pond Junction. The big winners were passengers to the cities South of NYC from Boston and points North. For the first time passengers did not have to change trains or have their trains ferried across the NY waterways to get through NYC. In the scale of the entire New York Improvements undertaken by the PRR, the Connecting railroad could almost be seen as an afterthought. 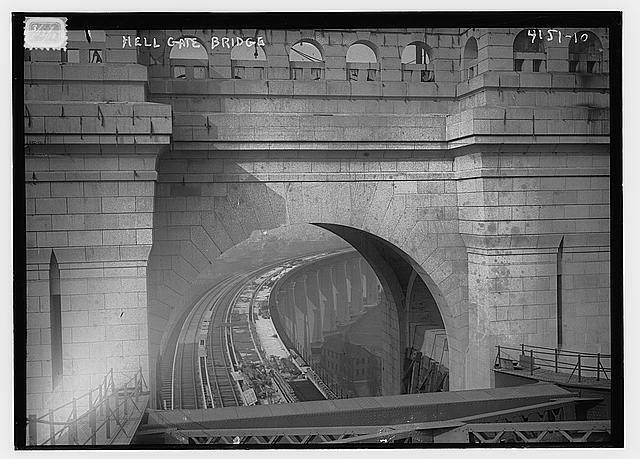 The North and East River tunnels were far more costly than the Hell gate Bridge, as large as it was. Here’s a map of the NY Connecting RR’s East River Division. 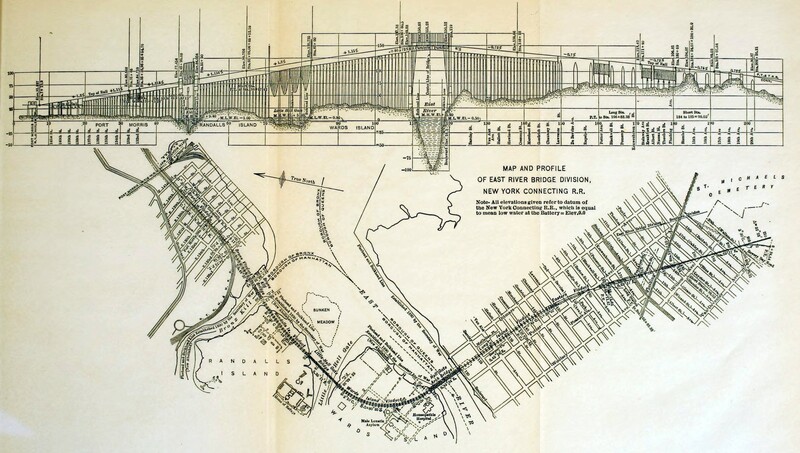 And map of the entire system in 1912, just before the Hell Gate Bridge was built. An important feature in the costly improvements being carried out by the Pennsylvania Railroad in and around New York is the building of a connecting railway for uniting the systems of the Pennsylvania Railroad and the New York, New Haven and Hartford Road. 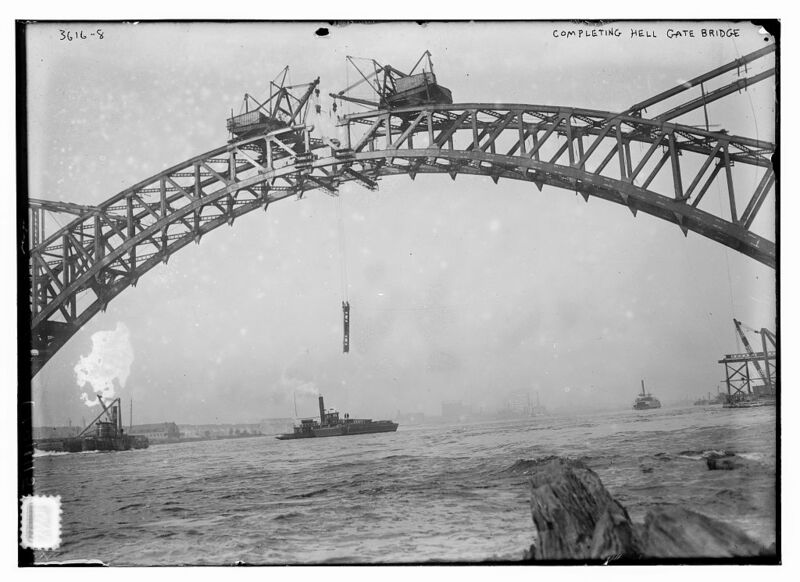 This connection will be made by means of a crossing of the East River, the most important feature of which will be an arch bridge (the largest in the world) of about 1,000 feet span. The plans for this bridge have been recently submitted to the Municipal Art Commission for its approval, in accordance with the franchise granted by this city to the company. The great steel arch will form part of a steel viaduct, itself the largest of its type in the world, the whole length of the structure, from abutment on Long Island to abutment in the Bronx, being 17,000 feet, considerably over three miles. With a wide, sweeping curve, the viaduct will pass over Hell Gate, Ward’s Island, Little Hell Gate, Randall’s Island and Bronx Kills. It will be not only the longest, but considerably the heaviest steel bridge in existence, over 80,000 tons of steel being needed for its construction. With its completion, the city of New York will find itself in possession of an all-rail route between New England and the South and West. Through trains from Boston may then run to New York, Philadelphia, Baltimore, and Washington, Palm Beach, New Orleans, Chicago, St. Louis, or any other southern or western city without leaving the rails. Hitherto cars for such through trains have been ferried around Manhattan Island from the Bronx to Jersey City. 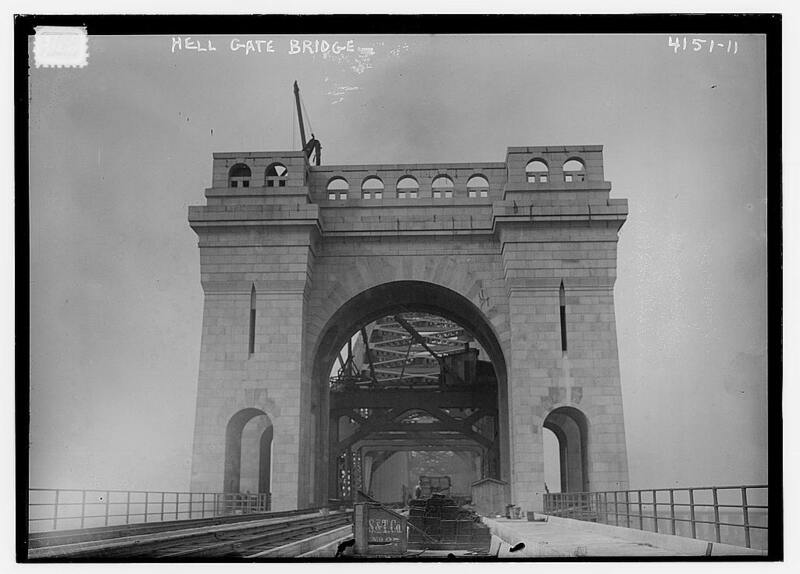 The steel arch which will span the waters of Hell Gate will have a clear span between abutments of 1,000 feet, made up of twenty-three panels of about 42½ feet between centers. The depth of the truss at the ends will be 140 feet; at the center, 40 feet; and at the quarters 66 feet. The reverse curve of the upper member of the arch at either end is explained by the necessity of raising the top member of the portal to a sufficient height above the tracks to allow head room for the trains. At the quarters, the height has been purposely made such that no increase in the sections of the arch members is required to meet the bending strains due to one-sided loading. To this end the height, here, has been made greater than one-quarter the rise of the arch, which latter is 220 feet. From this it will be understood that the reverse curve of the top member of the arch is strictly the result of the contingencies of the design. The lower arch member has a section of 9 feet by 6 feet at the bearing and 5 feet by 5 feet at the center, the width decreasing evenly from the bearing to the crown. The struts are all riveted box sections, and the suspenders consist of eight heavy angles laced together. The floor system is built on the customary method of heavy cross girders and longitudinal stringers. The floor beams are 8 feet in depth by 80 feet in length. The main arches are placed in vertical planes 60 feet apart, and the longitudinal portion of the floor system consists of eight lines of stringers, or two beneath each of the four lines of railroad track. Above the stringers is laid a solid wood floor of creosoted 8 x 8-inch timbers, packed tightly together, and calked. Upon this is 14 inches of stone ballast, in which are imbedded the cross-ties of the regular Pennsylvania Railroad standard track system. It should be mentioned here that the floor beams are the heaviest ever built for a bridge, the section of the bottom flange of the girders at the center being 6¼ by 24 inches, or 150 square inches. Wind bracing is carried in the plane of the upper and lower arches from bearing to crown; but the main wind bracing is carried in the plane of the roadway, and it is arranged as a cantilever truss system. The contra-point and expansion joint of the cantilever are located six panels from each end of the arch; so that the temperature strains of the suspended floor system will in no way affect the arches—in other words, the temperature stresses of the arch and the floor have been made independent of each other. The maximum compression in the arch is found at the bearing, where it amounts to 16,800 tons, decreasing from that to 13,600 tons at the crown. This compression is that due to the combined dead and live load, wind pressure, and temperature stresses. The abutments of the arch will be monumental stone and concrete towers, which will serve to divide the arch bridge proper from the steel viaduct which forms the approaches to it. The base of the tower will be built of granite; and it will rest on foundations of a very hard gravel at a depth of 20 feet below the surface. The upper portion of the towers will be built of molded concrete, and, as will be seen from our illustrations, the design of these towers is simple, massive, and dignified, and altogether harmonious with the design of the great arch itself. An interesting feature of this bridge is the method of erection, which will be carried through without the assistance of any false work in the whole 1,000 feet of its length. 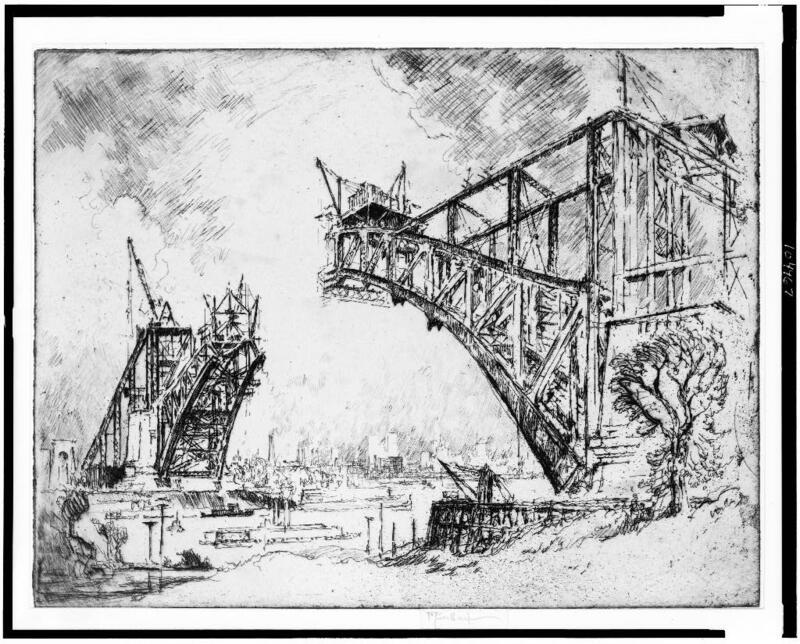 The arch will be built out in two halves simultaneously from each abutment, the steel work being guyed back to an original system of anchorage constructed in the following manner: At a distance of 507½ feet inshore from the abutment two huge wooden boxes or caissons, 12 feet wide, 42½ feet long, and 50 foot high, will be erected on the surface of the ground and each loaded with 850 tons of pig iron. Four lines of the stringers, which will subsequently be built into the floor of the bridge, will be laid in the planes of the arches in a straight line from each box td the abutment. Upon the top of the abutment will be erected two temporary rocker posts, and over these will pass the wire cables or eyebar chains, as the case may be, which will be used during erection to carry the load of the arches until they meet at the center of the span. The four lines of stringers will act as compression members, and prevent the movement of the deadweight anchorages under the pull of the erection cable, which latter will reach a maximum figure, when the arches are well out to the center of the span, of 3,000 tons for each arch. The overhanging arches will be held against wind pressure during erection by means of two cables carried down to anchorages, on each side of the main abutment. After the closure of the arch, the suspenders will be attached at their upper ends to the panel points of the arches, and to their lower ends will be riveted the floor beams. Upon the floor beams will be built in the whole floor system, with its stringers, wind bracing, wooden floor, etc. The bridge has been designed to carry on each of its four tracks a load equivalent to two locomotives, each with a concentrated load of 52,000 pounds on each of the four drivers, the total weight of each of the two engines being 190 tons, followed by a train load of 5,000 pounds to the lineal foot. This would be equivalent to loading the whole of the four tracks from end to end of the arch with trains made up of heavy freight locomotives; and so stiff is the arch that under this load, the deflection at the center would be only three inches. The three-mile viaduct will be made up of spans of from 70 to 100 feet, carried mainly on four-column rocker steel bents; but at every 800 feet of the viaduct there will be a massive stability pier of concrete, and also an expansion joint. It is estimated that the bridge can be built in two and one-half years, and at a probable cost of $12,000,000. This handsome structure was designed by Mr. Gustav Lindenthal, the former Bridge Commissioner of this city, to whom we are indebted for assistance in the preparation of the present article. The Hell Gate would be Gutav Lindenthal’s largest project. He would have like to build a suspension bridge over the Hudson, but that project kept getting delayed until after his death when Othmar Ammann built the George Washington Bridge. Here’s Lindenthal’s wiki page. Amman wrote the excellent article for ASCE’s transactions where the construction details of the bridge and it’s design history are shown. Volume 82[in the internet archive] of the Transactions of The ASCE has a good article on the Bridge Starting on Page 852. Here are the stages of construction. Here’s the Hell Gate Bridge Wikipedia entry. Historic bridges has some excellent links about the bridge. The images from the ASCE Transactions came from this page. Touring the bridge when you are not supposed to. Pics from the Library of Congress. A couple of drawings from a folder in my collection. The Historic American Engineer record. 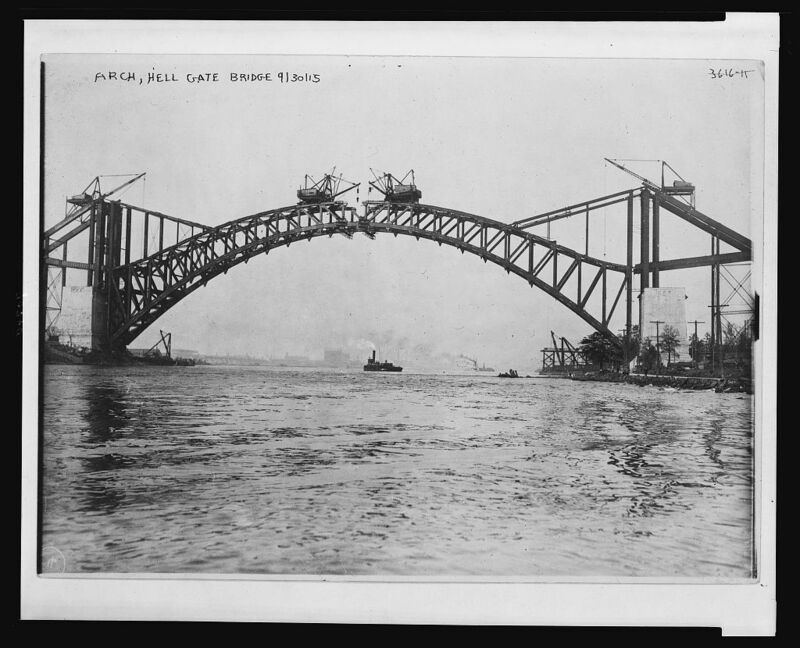 The Hell Gate Bridge was typical of it’s time. This was a time when people were not afraid to build and achieve great things. The bridge was a gamble on the future and to certain extent that gamble never really paid off, though the people building the bridge had no way of knowing the storm of regulation, outright government take over and price controls that was about to descend upon the US rail system. 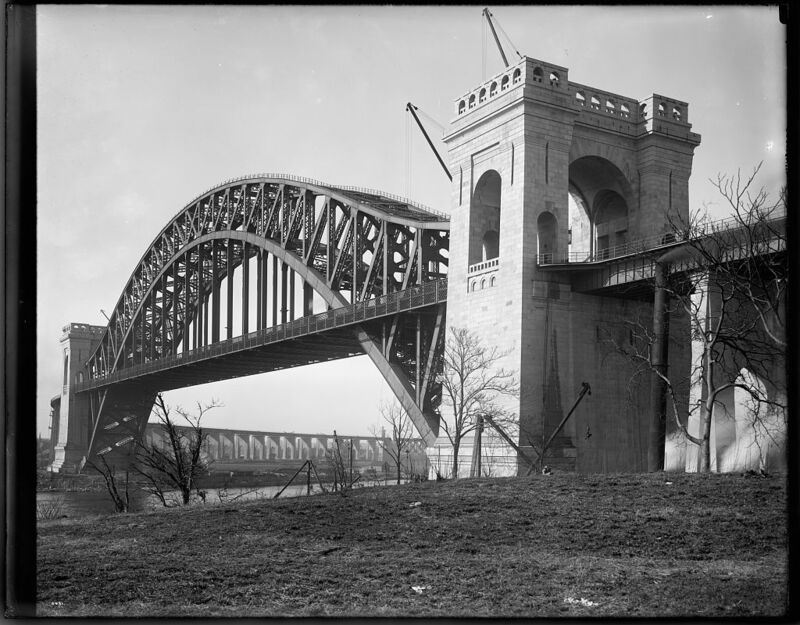 The Hell Gate Bridge was built for a future that never quite emerged for the New Haven, the PRR or the rest of America’s railroads. Still, the bridge is an incredible thing. Where would the Northeast Corridor be without it? Know the New Haven RR has had use of a “dead end” passenger bridge to Grand Central Terminal (since 1848, in perpetuity). Imagine if AMTRAK riders had to make subway change between Penn Station and Grand Central.